After her husband’s death in 1991, Majel continued to carry on his legacy, producing the shows “Earth: Final Conflict” and “Andromeda” based on archives that he’d left behind, and she has acted in a wide variety of other TV shows as far back as the 50s. 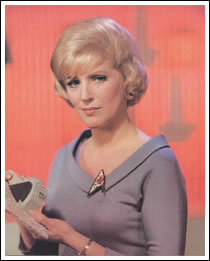 Sadly, Majel died today at the age of 76 as a result of complications brought on by leukemia. She will be sorely missed.